This beach home was in need of some TLC to bring the joy back into the kitchen,, dining, back porch, shed, pool area and backyard. It is a home meant for outdoor living, so ABLE renovated cleverly. The home is now enjoyed by its residents, inside and out, with the homeowner saying that her home now looks like a resort! 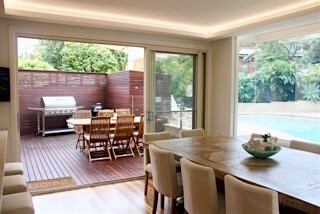 The kitchen and open plan, adjoining indoor and outdoor dining areas create an expanse of fresh, vibrant living space, perfect for entertaining. 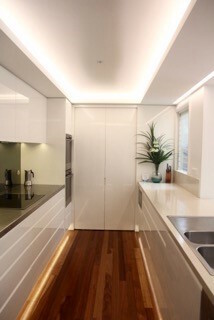 The custom kitchen joinery uses beautiful minimalist style to create a highly functional kitchen and smart storage space. Engineered thick profile stone for the kitchen bench with a waterfall edge has ample storage for dishwasher and cupboards. The wide hub leads us out to the timber floored dining area. 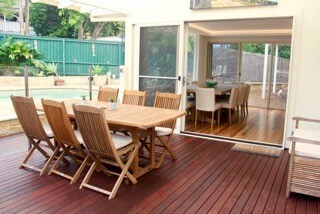 Open plan eating areas, indoors and out, with a tall fence for privacy and windbreak. 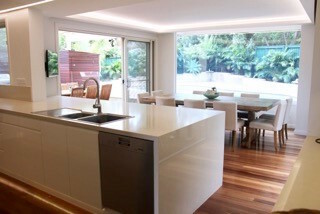 The flow through has been designed to make this space easy to move in and very liveable. 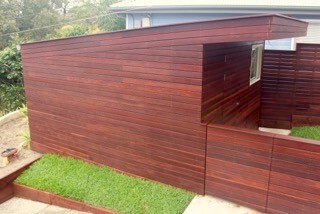 The outdoor garden shed with hardwood Australian timber surround and awning are levels above the average garden shed! 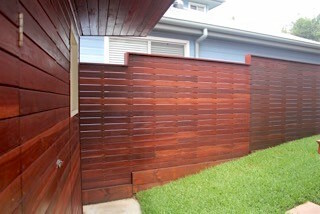 The hardwood timber fence extends up the slope of the backyard, with discrete slots to allow air movement and just enough view of what’s behind the fence.